Another milestone has come and gone: the Junior Prom. After six weeks of preparation, Annalisse celebrated her big night with the perfect date: her longtime friend, Peter. (It was so nice to have her forgo her imaginary boyfriend, Russell, for the night.) After my nail biting return trip from Austin (Would I make it or would I miss my daughter's big night?? ), I headed over to where she was getting her makeover (thanks to my niece, Nicole, who took over when I couldn't be there!) and hung out until she was done. After a quick change into her dress it was time to greet Peter and his parents, Sherry and Tom, who came over for some pictures before the kids joined the "big group" (27 kids!) for pictures and the limo ride to the prom. She looked so beautiful and grown up, and Peter was very handsome also. A really special night for all of us! I arrived back from my trip to Austin yesterday at 2pm, JUST IN TIME FOR PROM PREP, but more about the prom in my next blog entry. First, Austin. 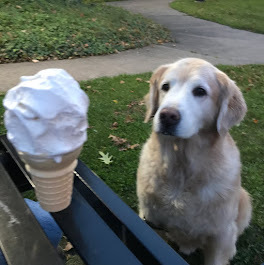 If you've been a long time B@ker Blog reader, you'll remember the heartbreaking story of Casey, our first golden who died by an overdose of chocolate in April 2007. Her sudden death really devastated us, probably more than we ever thought it could. At the time we said "no more dogs," but it soon became apparent that not having a dog left a huge void in our lives. After our search for another golden, which we admittedly were reluctant about because of our experience with Casey's destructive nature, we decided on Jasper and our experience could not have been more different. Submissive, cuddly, loving and non-destructive right from the start, he was, and continues to be the, the PERFECT DOG. We were so fortunate to be able to carry on after the loss of Casey with such a sweet boy. PACK FIVE DAYS WORTH OF SCHOOL SNACKS IN ADVANCE SINCE NO ONE SEEMS TO BE ABLE TO DO THAT. What have I done to make these people so helpless that they can't cook a meal or pack a snack? It seems there's always a price to pay for being away, doesn't it? This has been a pretty good week all around for the Bakers. It started with Annalisse finally securing a prom date (she broke down and asked a guy friend that she's known for years, and he said "yes"; I'm still a little bewildered that no one asked her, and by the fact that her friends didn't help her out in this regard, but I needed to let her work that through herself), and continued on with a good third quarter report card for her and word that Cam "aced" a calculus exam on Friday (his hardest subject). Then, today, Cam's boat came in first in his race (the prize: the losing a crew t-shirt from the losing team which, according to Cam, is cooler than a medal). So, lots of positives this week. It helps balance out the tough weeks. 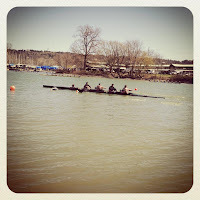 After Cam's race against Ithaca College tomorrow we'll head out on our journey on Easter Sunday. This will be the second Easter in a row that we're on the road, so it's little disappointing that we don't really get to relax, reflect and enjoy the day. Still, fun stuff ahead!